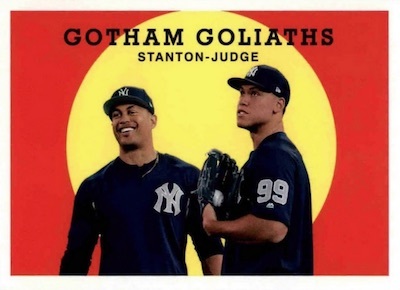 With 2018 Topps Archives Baseball, the annual nostalgia trip kicks into overdrive for those MLB collectors who have a special affinity for The Sandlot. Of course, there are still a ton of pro baseball players to collect, as well. 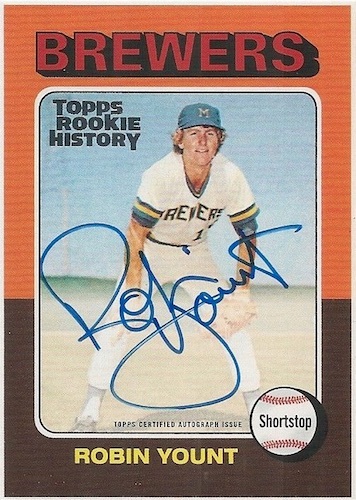 Every Hobby box promises two autographs and each case should deliver one Topps Rookie History Autograph. Per tradition, Archives highlights several past designs in the base set. In 2017, it was 1960, 1982 and 1992. For 2018 Topps Archives Baseball, the focus moves to 100-card sets for 1959 Topps, 1977 Topps and 1981 Topps. Parallels for each include Purple (#/175), Silver (#/99), Blue (#/25 - Hobby only), and Gold (1/1) versions. There are also base Variations to hunt for in the boxes, plus "a limited number of unannounced card variations, themed accordingly." The base numbering also includes the 1959 Topps Combos cards for current pairings, and 1977 Topps Turn Back the Clock, which looks at past baseball moments. Likely to see considerable attention from the hobby, the 2018 Topps Archives inserts for The Sandlot make use of the 1962 Topps design, adding Green (#/99), Blue (#/25) and Gold (1/1) parallels. These cards were first revealed in the 25th-anniversary Blu-Ray release for the movie. Offering an all-new assortment, the 2018 Topps Archives Baseball checklist features inserts that tie into the sets used for the base designs. 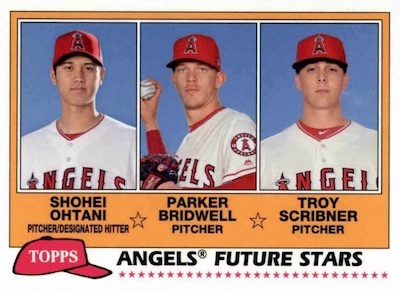 1981 Topps Future Stars has new team-based trios. 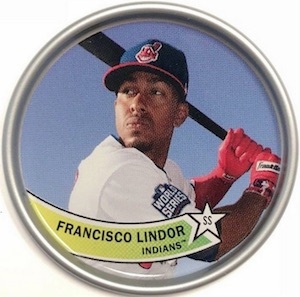 In addition, Coming Attraction borrows the 1993 design for top 2018 rookies, while Topps Rookie History recreates famous rookie cards. These Topps Rookie History cards also have foil stamp parallels in Purple (#/150), Green (#/99), Blue (#/50), Red (#/10), and Gold (1/1) editions. You can't have The Sandlot inserts and not throw in some signed versions. Luckily, 2018 Topps Archives Baseball does not disappoint with The Sandlot Autographs. Signed parallels consist of Silver (#/99), Blue (#/25) and Gold (1/1). The hard-signed Fan Favorites Autographs line, an Archives staple, returns with another run of top baseball players and personalities. These also have Purple (#/150), Silver (#/99), Blue (#/25 - Hobby only), and Gold (1/1) parallels. Other signed inserts in 2018 Topps Archives Baseball are found in Coming Attraction Autographs and the case-hit and Hobby-only Topps Rookie History Autographs. Finally, the 1993 Topps All-Stars Dual Autograph set, numbered to 25, displays on-card signatures from modern stars on the '93 design. 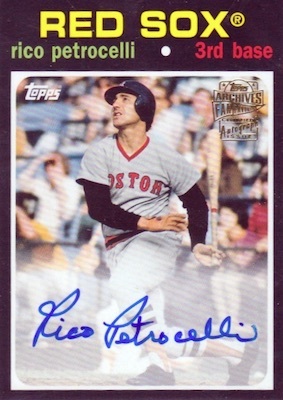 Buybacks supply the remaining hit choices via Topps Originals Autographs (#/10) that stretch multiple decades. Buy 2018 Archives Hobby boxes direct from Topps for $107. 300 cards. Shop base sets on eBay. PARALLEL CARDS: Purple #/175, Silver #/99, Blue #/25 (Hobby), Gold Foil 1/1. 9 cards. Full guide and gallery. 11 cards. Buy on eBay. PARALLEL CARDS: Silver #/99, Blue #/25 (Hobby), Gold Foil 1/1. 68 cards. Design year noted. Buy on eBay. PARALLEL CARDS: Purple #/150, Silver #/99, Blue #/25 (Hobby), Gold Foil 1/1. PARALLEL CARDS: Blue #/25, Gold Foil 1/1. 29 cards. Serial numbered. 1 per case. Hobby only. PARALLEL CARDS: Red Foil Stamp #/10, Gold Foil Stamp 1/1. PARALLEL CARDS: Gold Foil 1/1. 15 subjects. Serial numbered #/10. PARALLEL CARDS: Green #/99, Blue #/25, Gold Foil 1/1. 25 cards, including 5 short prints (SP). FOIL STAMP PARALLELS: Purple #/150, Green #/99, Blue #/50, Red #/10, Gold 1/1. 25 coins. 2 per Blaster. Can’t wait for this release…always a favorite! I see 1981 is new for the product and like to see the check list to , like the sandlot cards are great!!! Finally a release im really looking forward to! Finally, ’77 & ’81 get some love. I am bored with ’82 and ’83 year after year in some product or another. I CV collected lots of those as a kid and like both but it’s time for a break, although I really enjoyed the ’79 design a few years backl. Really looking forward to this as I enjoy all the years used, or would have been perfect if 1980 would have been used as it to me is the nicest looking card design of the ’80’s. Wait what?!!! Why did they push it back to September instead of the 15th? Anyone know why? is this coming out this week or in Sept? Thanks Trey, that’s disappointing but at least Soto will be in it. Looks like none of the old Yanks – Ruth, Gehrig, Dimaggio etc. Blasters are out and hobby is delayed. i picked up a few on ebay. What? No Benny “The Jet” Rodriguez autograph?!? Or the dog Hercules? 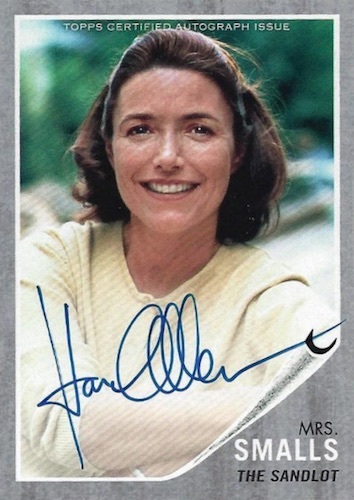 C’mon Topps they were two of the major stars in the film. Not to mention James Earl Jones who was completely ignored. Not a fan of these ‘turn back the clock’ issues. Frankly they are just tacky. Hate ’em. I’ll save my dough for better sets. Looks like the 1981 variation code on the back is also 326. Pulled the Ernie Banks variation today. The image looks to be Banks playing first base at the tail end of his career or perhaps during an old timers game. Been wondering if the Terry Steinbach autograph card even exist’s. Haven’t seen any and haven’t seen any redemption card either. I know from personal experience he is a very difficult signer. I love this set and it looks awesome again this year. I purchased a ton of blasters and packs. I have a feeling they had major problems with distribution of the cards and that’s why hobby is delayed. I’m avoiding buying any more retail. @Mark, ugh, the same thing happened to me AND with the same Devers cards you got! Went to a show, got two blasters, and, with the exception of the inserts, the cards were all the same! VERY disappointing! Topps is getting craftier with their releases I see. 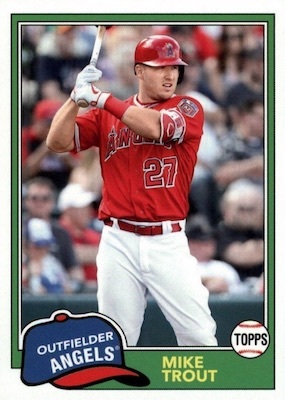 Unload the retail blasters in August and then release the hobby version in September after the prices on some cards have been already jacked up on the secondary (Ebay) market. I suspect many of the mail in redemption cards will have the actual signed cards in the hobby version as well. I thought this was being delayed, but I picked up 3 blaster boxes at Target and a few Fat Packs. Looking forward to opening this up, I love Archives. Hobby is delayed until the end of September but retail came out on August 15. I see now that the release date for hobby has been pushed back to October 24. Hope whatever is causing the delay is worth the wait. Sandlot Signature Set is great addition to the product. Love when they put something like this in the set. 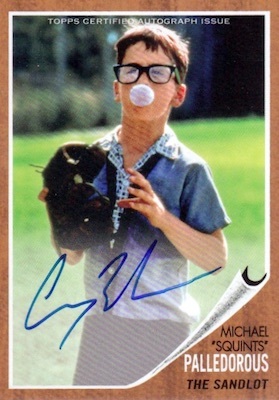 Except the Wendy Peffercorn Auto the poor squiggle effort is a piece of garbage. What Marley Shelton is too busy to give more than a half second effort per card. Please…. WHAT only BASE cards & 1 Insert ? Tigers Ingnored again ! RANDY ( See above ) was right . SO many reasons to have Inserts of TIGERS in this set . Especially FAN favorites . Topps is Blowing it again ! Just because they are not doing well this year , Does NOT mean there is not a BIG following . You have have lost a bunch of money I have NOT bought much this year due to lack of Tigers. Dropping over $125 on a Hobby Box isn’t something I do on the regular. But I’ll make an exception when it comes to Archives. I also avoid pre-orders/pre-sells. But I made an exception for Archives this year. I figured it was close enough. A day or so later I unexpectedly found a lone blaster box at Wal-Mart. I took that as a sign that my hobby box must be on it’s way! NOPE. More delay. I buy a healthy mix of blaster and hobby boxes. 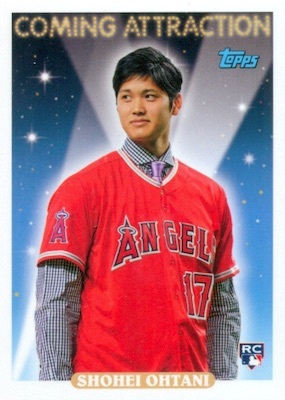 I really hope this isn’t just Topps’ way of moving more retail. Because that would just be *!#$**! I suspect Topps keeps delaying the hobby boxes to get more of the actual autographed cards in them instead of having the send away redemption cards which to my knowledge have not been redeemed yet… which I think by the way is pure BS. If you are going to have the cards that are supposed to be in the set then don’t advertise or include them if they are not. Got this info from a very well respected local hobby owner. Release date is pushed back into October. Topps had a deadline to meet with the large retailer (WalMart & Target). If they didn’t meet that deadline they will drop the products and Topps would be stuck with the stock. They rushed the retail blasters/packs to get them into stores. I’ve been following this product very closely as I’ve also purchased a ton. Compared to last year there are very few rookie autographs coming out of retail. The majority are the Rookie Inserts Coming Attractions. The majority of the Archives Autos coming are are Fan Favorites non current players. I have a feeling Hobby is going to be loaded. I’ve enjoyed this product in the past, so I bought two blaster boxes at Walmart. One was fine, no big hits. The second was missing its pack of coins, and when I started opening packs I realized they were short on cards – 5 or 6 per pack instead of 8, and all base cards, no inserts at all. Contacted Topps via their website two weeks ago, no response yet. Buyer beware!!! I strong disagree with Topps stamping classic cards. I hope they stop doing this. Otherwise i think it is an interesting concept, but the price is too high given the card stock they are using. The Sandlot cards and coins just put this set into the heavens for me. Wendy Peffercorn! Hercules! The retail boxes had more hits than the hobby. I don’t know if it had anything to do with the delay, but I bought a few retail boxes beforehand, had several high-dollar hits. I anticipated the hobby boxes and bought 3. The only auto’s I got were all Fan Favorite nobody’s and nothing beyond that. Was hoping for some errors, variations or any kind but notta. Retail I got the Othani error, Hoskins Real One Auto, and some other 100$+ card I can’t recall atm. The boxes…All crap. Someone else mentioned that the only auto’s were Fan Favorite ones, I can concur. Holy crap! Just went to Walmart and looking at all the baseball product that was freshly replenished. So many choices but I could only make 1. Archives it was – and awesome choice). I grabbed the 3rd blaster from the front and pulled an Alan McClennan Sandlot auto! 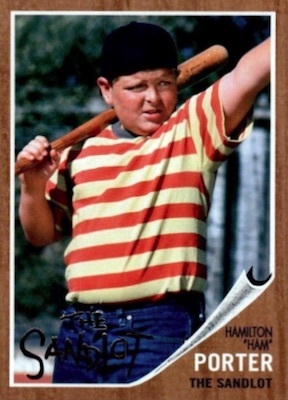 Wish my other Sandlot card was signed (Hercules). Gave product 4 stars as I do not know the auto/variation seedings in hobby but it looks like about 1:7 blasters for an auto of any kind. Are the Torre autos from hobby boxes misprints? They’re the only autos I can find that don’t have the usual foil “Fan Favorites” stamp on the front–there’s a printed version, but no foil. Of the few posted on eBay, none of the Torre base autos have foil–from what I can tell, the base autos for everyone else does have a foil stamp on the front (parallels vary by color). Any ideas as to the how/why the difference–or am I just simply missing something (always a possibility). Late additions are sometimes slightly different from the main run. It appears that he was a redemption in retail and Topps mentioned they have been delaying Hobby releases to cut down on the redemptions. Always a must have for this collector. But I’ve had so many amazing hits throughout the Archives series as these 2018. To top it off I just pulled a Mike Trout Rookie History 1/1 Auto. I’m still shaking. 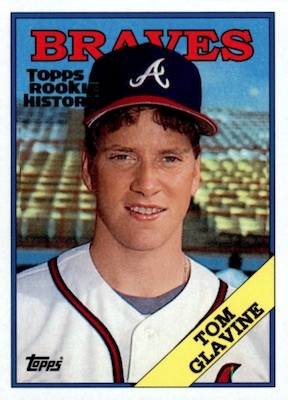 Chrome was King for me as far as Topps went but Archives has pulled ahead and is solidly in the lead. Bought two boxes as I am connected to the ’81 frames. I started collecting cards when I was 10 in ’81 and almost completed that set (finally). Average hits – I did pull three autos in one box; Leyland silver, Kennedy and Aurillia and then Steinbach and Nagy silver. No other key hits of note. But I love Archives, best set per year.